A particularly fast night for THE FLASH. CW: THE FLASH zoomed 0.2 from last week to a season high 1.6. 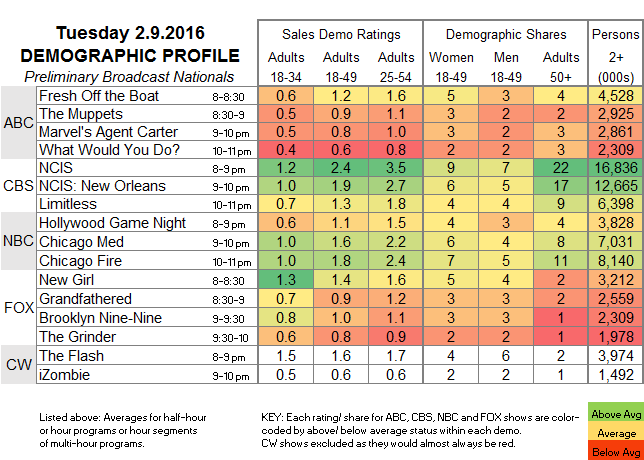 IZOMBIE was up 0.1, although at 0.6 it lagged behind its lead-in. ABC: FRESH OFF THE BOAT fell 0.2 to 1.2. THE MUPPETS and AGENT CARTER were steady at 0.9/0.8, then WHAT WOULD YOU DO lost 0.1 to 0.6. CBS: Airing new episodes for the first time in 3 weeks, NCIS held at 2.4, and both NCIS NEW ORLEANS and LIMITLESS were up 0.1, to 1.9/1.3. FOX: NEW GIRL continues not to suffer the temporary loss of star Zooey Deschanel, as the first episode featuring Megan Fox kept last week’s 1.4. GRANDFATHERED fell 0.1 to 0.9, BROOKLYN NINE-NINE was steady at 1.0, and THE GRINDER got a much-needed 0.2 boost to 0.8. 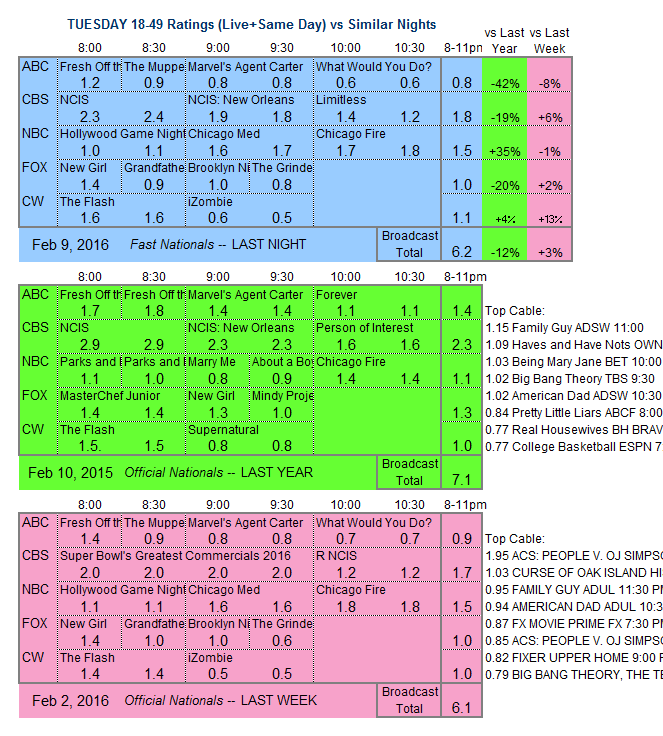 NBC: HOLLYWOOD GAME NIGHT, CHICAGO MED and CHICAGO FIRE remained at last week’s 1.1/1.6/1.8. Tonight marks the last appearances of 2 BROKE GIRLS and MIKE & MOLLY in the Wednesday 8PM hour, before SURVIVOR returns next week. BROKE moves to Thursday 9:30PM, displacing the canceled ANGEL FROM HELL, while MIKE’s remaining episodes are as yet unset.